It was 1979. Mark Pivetta was just a guy with $600 and an idea to start a construction business with his brother. Fast-forward to 2018, and life is looking pretty good with a growing demand for work and Hitachi equipment to get the jobs done. 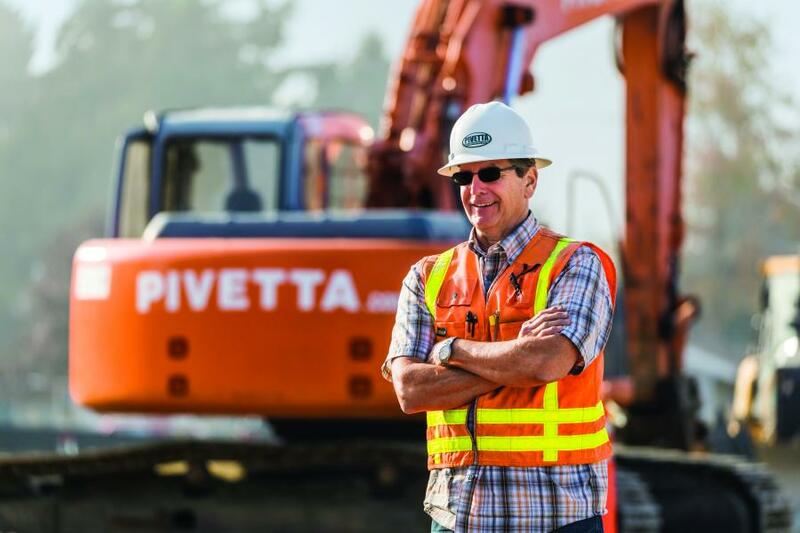 Although Pivetta Brothers Construction, based in Sumner, Wash., started from humble beginnings, owner Mark Pivetta has grown the family-run company into a powerhouse contractor while keeping a down-to-earth business culture. But don't let Pivetta sell himself short. After nearly 40 years in business, Pivetta Brothers Construction is doing a lot of things right. And one of those things is having reliable equipment on job sites — like its fleet of Hitachi excavators. Pivetta, a former heavy equipment mechanic, will be the first to admit he's got an addiction — to construction equipment. Before investing in his equipment, Pivetta definitely does his homework. Pivetta's collection of Hitachi excavators has grown over the years. He currently has about 15 in his fleet, which includes a mix of veterans and shiny, new iron. Pivetta also meticulously outfits his equipment for maximum efficiency. 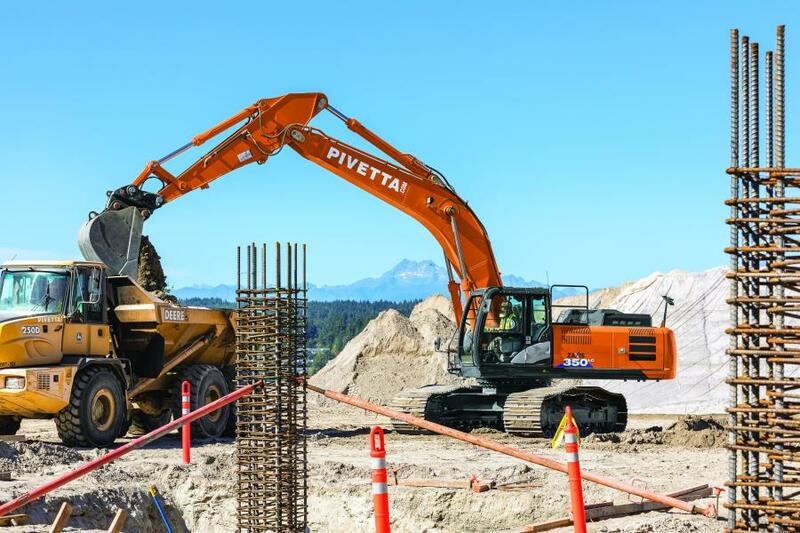 Armed with its Hitachi fleet, Pivetta Brothers Construction has made a big impact on the western Washington area. The company completes public, private and governmental projects from pump stations, lift stations and water tanks to mass excavation, road work, infrastructure, bridges and more. With the Seattle and Tacoma ports nearby, the company has taken on a growing demand for building warehouse space. Among other projects, the company is working to complete phase one of a 575,000-sq.-ft. warehouse on the Port of Tacoma and just recently completed a 550,000-sq.-ft. warehouse project with 15,000 ft. of storm water and sewer pipe as well as fire line and fire protection in Lakewood, Wash.
A major project in progress for Pivetta Brothers Construction is the Harrison Medical Center expansion in Silverdale, Wash., which includes a nine-story hospital, a four-story medical center, a five-story parking garage and 11 acres of site development. The location itself is impressive — set between backdrops of the Olympic and Cascade Mountains. The company has completed work for the medical center and parking garage and has moved on to the hospital structure. 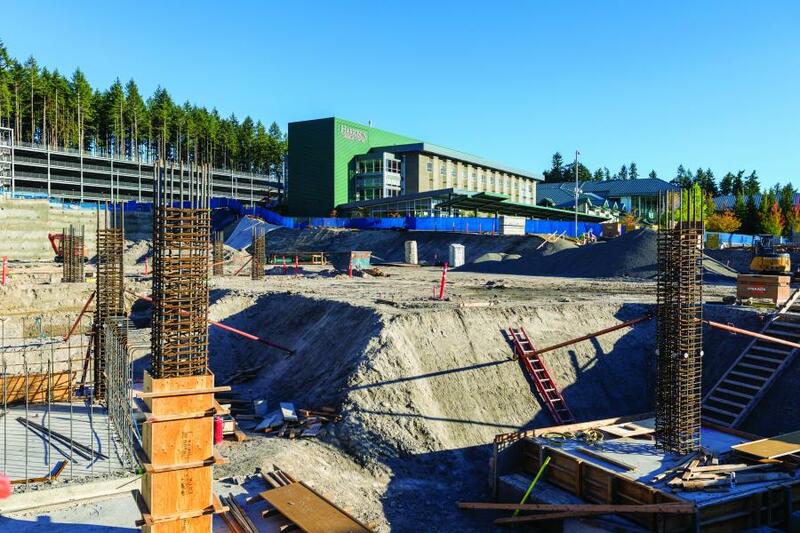 The new $350 million Harrison Hospital, which will replace an older hospital in Bremerton, will offer private patient rooms, critical acute care services including heart care, a Level III trauma center and an integrated cancer center. 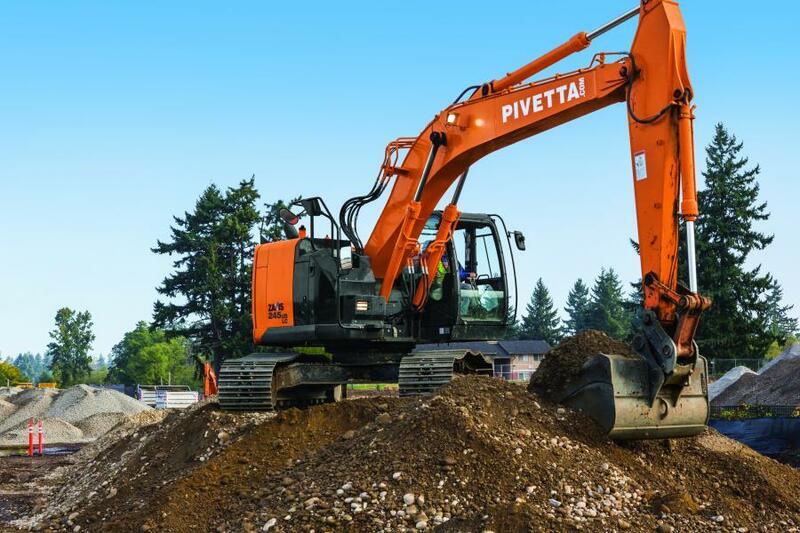 Among other Hitachi excavators, Pivetta has dedicated his new ZX350LC-6 as the primary workhorse on the job. When it comes to the company's secret to success, Pivetta said the machinery makes life easier, but the people make the real difference. Along with dependable dealer support, Pivetta also knows how to hire outstanding employees. As Pivetta looks toward the future, his down-to-earth attitude and uncompromising work ethic continue to be reinforced with a dose of true grit. Pivetta Brothers Construction Inc. is serviced by Papé Machinery, Fife, Wash.